Doesn't FTDNA do MyHeritage's lab work? This sounds like either a faulty algorithm or the use of differing default thresholds (e.g. 7 cm vs 10 cm). I hope they explain this like yesterday. We must strive for consistancy, not confusion. It's quite possible that they use the same or identical equipment to obtain the data, but perform the analysis separately. Bear in mind that the cM "distance" is itself an estimate based on the empirically-derived recombination rates along each chromosome. A difference in models, a difference in thresholds, a difference in mismatch run-length limit, can all affect the calculated cM values, given the same raw data. For consistency, the testing companies would have to agree on quite a few parameters. However, they consider their parameter settings proprietary--the "secret sauce" that differentiates the services they offer. I don't think any of us expect the companies to report the exact same numbers, but it should be close. If it isn't, it throws into question the basis of our entire field. Myheritage does use FTDNA's lab to process the DNA, however they use their own algorithms to report on matching. What is interesting for me in these examples is that myheritage reports less DNA than at gedmatch. In the more distant relationships the issue is that they report too much shared DNA (assumed to be due to imputation). I don't know how to get this reply to show my name!! My cousin and I both uploaded to My Heritage. We share 158cM on Gedmatch and 133cM on Ancestry. We have never shown up on each other's match list on My Heritage. My estimate with my full aunt is also considerably lower on My Heritage than Ancestry and Gedmatch. On My Heritage, they show we share 1328cM vs a 1709cM share on Gedmatch and 1641cM on Ancestry. My sibling: Ancestry 2453 cMs over 60 segments, FTDNA 2401, GedMatch 2575, MyHeritage 2279 over 37 segments. All places other than MyHeritage believes this is my full sibling. MyHeritage believes this is either a half sibling, uncle or full sibling. I see similar results with my match to my 1/2 brother. At Ancestry, we match at 1681 cM. Upload to GEDMatch shows 1728.9 cM, and a Family Tree DNA transfer shows 1651 cM (ignoring segments <7 cM and shared X yields 1614.45 cM). My Heritage shows us matching at just 1110.8 cM. This isn't just a case of minor differences in matching algorithms, it's plain wrong. My father was adopted and I think (almost 100%) sure I found his BF family. I found on my heritage a potential half sister who is more accepting, and later a potential half brother tested to verify. The half brother is very skeptical saying these test are unreliable. He has talked to me some but unsure how to find more information to prove the relationship between him and my father. His father fits age wise too and I have images of them that look like the same person. These are the my heritage numbers for the half brother to my father 22.4% (1,625.5‎ cM) 23 shared segments and 198.7 CM. the half sister is 31.2% (2,265.8‎ cM) 25 shared segments and 195.6‎ cM. GedMatch kits numbers are H402211, H833718 and A104247. the ged match numbers are 1709.4 cM and 192.2 cM for the half brother and 2307.3 cM and 193.5 cM for the half sibling. My Heritage list these people as Half brother, uncle or nephew and Aunt or niece, half sister, sister, grandmother or granddaughter. My father was adopted in Indiana so I believe we can not see his adoption records until this coming July and that's if they show any father listed. not sure what else to do for this half- brother to help him know this is real. I can only hope the half sister is also still accepting as 3 or 4 siblings believe this to be false. Only 2 have tested and i have suggested the other two test with maybe FTDNA or Ancestry since my father's DNA is there as well. Thanks much. Thank you. So far forming a good relationship with my father's new half sister. Thanks again for the help and the kits of kindness program that helped my father get his kits. We have answers now because of your great work with that program and are very thankful. Thanks again. That is great news. Thank you!! ​Hi All, I am MyHeritage's Chief Science Officer. We are well aware of these issues that affect a minority of our close matches. My team is actively working on this and we are in the final steps of a major overhaul to our matching system that resolves many of these issues and better tunes our parameters for our fast growing database. It is a good time to remind that our database allowed multiple success stories that involved half-siblings and other close relatives and allowed them to find their birth families. We will be in touch with you shortly to check your findings on our new system with the same DNA kits and ensure they are no longer experienced there. We will give another update ASAP. Thank you for taking the time to comment, Dr. Erlich. I am glad to see that this is being addressed, but unfortunately, I am not convinced that it is only affecting a minority of the close matches based on the reports I see pouring in from the many discussions going on at Facebook. Even if it is, it is still affecting a very large number of people and is, undoubtedly, a significant problem. Since you state that MH was well aware of it, I strongly believe that it was MyHeritage's responsibility to warn their customers about this known issue so as not to risk misleading them regarding the actual relationship to their close matches. Further, you mention it is a good time to remind my readers about success stories, but I had already done so at the end of the post in a note that was added shortly after publication. I will also remind everyone that I have been, by far, the most vocal among the genetic genealogy community about the success stories we are seeing come out of MyHeritage, so my concerns are definitely not stemming from any bias against MH. Instead, I very much support MH in their efforts. I look forward to the updates from MyHeritage regarding the correction of this problem and other similar ones we are currently seeing. Dear Dr. Erlich, How is it that you were ""well aware" of these issues but failed to address this sooner? The fact that myHeritage didn't care to notify the genetic genealogy community directly is unconscionable. You waited until someone got the goods on myHeritage. This is not behavior that garners trust. I have a known maternal half-sister that I have been in contact with for 20+ years, found and confirmed by papers and confirmed by bio-mother. I manage her kits. This is a huge problem! And it is a problem with My Heritage! I have a number of matches from other services turning up at MyHeritage. Most of them are known paper trail matches at Ancestry. The numbers all pretty much agree with each other. Nothing outlandish. But I wonder about some of the other matches who haven't tested elsewhere. Full sibling (brother): FTDNA -- 2398, largest segment 140 cm ; Gedmatch 2,535 , largest segment 143.3; MyHeritage 1657.4, largest segment 151.9. Note: My Heritage says he is my half sibling or nephew. Something is not right here. Wow, that is certainly misleading! MH is a transfer from FTDNA. Is it possibly because MyHeritage is using a minimum other than 7cM segment lengths? What happens if you adjust Gedmatch to a 10 cM minimum, or 20 cM minimum? Then does the Gedmatch result look more like MyHeritage? Good thinking, but that is not the explanation. Close relationships like this typically don't have many, or any, short segments in common. I looked at the Gedmatch comparisons for two out of three of the cases above and the segments were all larger. Is the GenMatch secure or is a highly shared site? Yes, the GedMatch is the site where everyone uploads their raw autosomal DNA results, regardless of a company they test with. It seems pretty secure. Your data will be visible to anyone who also uploads their data at GEDmatch, and you will have to give an email address - you can use a fake name, and you can set up an email address (they are free at Yahoo, Gmail, Juno, some other places) for that purpose only, but you are not going to be keeping things private at GEDmatch. I would not call it secure. Your data, as in your raw data, is secure at Gedmatch. No one can get a file of it from seeing you on Gedmatch. But your match list is available to anyone with your kit # (which is visible if they see someone else's match list that you're part of). If my results as far as where I'm from in the DNA results do not make sense when it comes to my family's research over the decades, what do I do? Will sending my info over to the other site show any difference or am I one of those who has bad results? My family is a big portion Irish and Menorcan yet it doesn't show. And yes I have a lot of partial matches on there saying like third cousin twice removed and so forth. By the end of this month my parents results come in. Will this change my results? Or does this only show their results? And what if my mother and father do not say they are middle eastern or these crazy results? I would love to chat more with you and make better sense of this. My dad's 2C1R shows as a match to me BUT NOT to my dad at all! On Gedmatch they share 175.3cM's. That should certainly be reported as a match on any site. I have been hearing a lot of situations similar to yours. I'm hoping that the updated matching algorithms will fix these problems. It's worth noting that anyone who has tested at MyHeritage can benefit from a free transfer to FTDNA. MyHeritage transfers do not incur the $19 fee to access the chromosome browser and the MyOrigins report. Matches can also be checked out at GEDmatch. Thanks Debbie Kennett for posting one of my MyHeritage missing matches. There's actually two missing "2nd cousins" (one predicted on Ancestry and 2-4 on FTDNA) the other an actual, plus the usual slew of overstated matches. 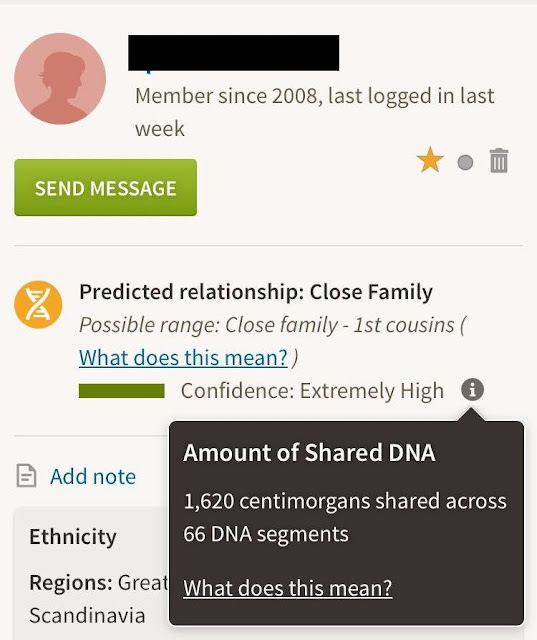 MyHeritage are certainly taking their time to improve their matching algorithm - and provide the chromosome browser promised back at RootsTech in February. CeCe, we have DNA at FTDNA and 23andMe. I have also uploaded to Gedmatch. We have multiple matches to an ancestor shared 8 and 9 generations back who are estimated as 2nd-5th cousins. Some match on more than one chromosome. What am I missing? Do we have common lines closer than 8-9 generations? Thank you! I have found only one known relationship through myHeritage and it is a bit bizarre in that I match the cousin higher than my mother. He is a second cousin 2x removed to my mom and matches 0.9% (67.9 cM) 5 shared segments and 30.2 cM largest segment. For me (as a third cousin 1x removed) he matches 1.0% (70.0 cM) 6 shared segments and 31.7 cM largest match. So far, I keep an eye on matches but I don't really trust the numbers. I've uploaded everywhere now and have relatives who have done the same with widely differing cM matches coming back from all the testing companies. Being an adoptee I'm finding it muddies the waters (one example being a cousin who matches 105 cM over 19 segments on FTDNA, 89 cM over 5 segments on Gedmatch, 53 cM across 3 segments on Ancestry and 55.8 cM over 4 on MH. What is really perplexing me is my highest match on MH (someone who hasn't tested elsewhere, or uploaded to Gedmatch) who I match at 2.1% 153 cM over 6 segments. Has anyone any pointers as to what my match with her might be, given the vagaries of MH please? A cousin matches me at Family Tree DNA and Gedmatch. But on my heritage my name shows up on her list of names but she is not on my list of names. This may explain why my maternal half-brother and his 3C do not show up as matches, but my brother's daughter does show up as a match, and they are 3C1R. I have never trusted GENI or My Heritage. Not only are the numbers way off, but it has failed to show matches that I know exist because I transfered them. I transferred my Ancestry results there over a year ago. Months later I realized that I also had authority to transfer two family members DNA. I made the transfer on May 18, 2017. Neither of them has showed up as a match to me as of November 2017. These aren't low level matches. On Ancestry one matches me at 856 cMs and the other is at 294 cMs. GENI has a slew of its own separate issues. Examples from my match list: the relationship of a a 32.7 cM match is "your third cousin once removed's wife's first cousin 6 times removed's husband's aunt's husband's 7th great niece" (really!!) 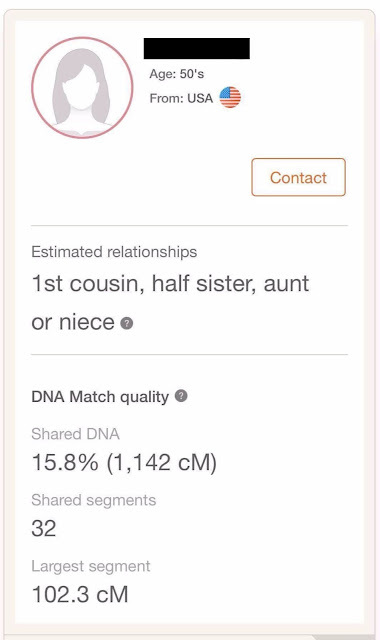 and a 24.7 cM match is my "your first cousin twice removed's husband's first cousin thrice removed's wife's brother's wife's fifth cousin five times removed's husband" WTF????? I reference trees and other data on My Heritage and Geni as simple clues that cannot be accepted without further substantiation. And I also hate, hate, hate that they show females using a married name rather than the maiden name. A bit late to the party but thought I would throw this out. My Paternal aunt. Gedmatch, 1752.9 cMs, MyHeritage, 1339.8 cMs. She has never had more than 13 matches. I have 81 with many that match her on Ancestry and Gedmatch but not MyHeritage. That alone tells me MyHeritage is not ready for prime time. I have another example. A match on FTDNA showed 984 shared cMs, while My Heritage listed it at 687. That seems like a big difference to me! I agree it's a pain searching for women. I'm new to the genetic searching. So I have found many people grabbing my relatives and not excplaining why they are in their trees. Along with do I bother to contact3rd cousins twice removed? I'm never sure. And on heritage I don't get great responses to my asking them to add me to begin with. I'm skeptical.I don't want to be.But I'm used to following the paper trails. I'm having a wall about the military files and immigration files. I'm late entering this discussion but wanted to contribute my recent experience in this regard. I recently had my brother tested at MyHeritage, which I take from earlier messages means he was actually tested at FamilyTreeDNA, as was I previously. But obviously their assessment of results differ widely. While we do share approximately the same Cm on both sites (2370.1 vs 2375) their ethnicity estimates are way off. Note in particular how non-specific the groupings are. They do not even attempt to discriminate between the various ethnicities found in the British Isles. None of these groupings is particularly surprising if you keep in mind that these ethnicities can come down over many generations and the migration of humankind from Africa had to come through Southeast Europe and West and Central Europe at some point in our history. Now you know that I had one Scottish grandmother, so it is theoretically possible for me to have a maximum of 25% Irish, Scottish and Welsh come down to me through the normal process, but no more than that. The reason being that my ethnicity on my mother’s side is 100% English as far back as we can trace it and on my father’s side, with the exception of his mother, and a small input of Irish heritage from a grandmother, his heritage is also 100% English. I confronted MyHeritage with these facts and they pulled out a boiler plate explanation which essentially said that when you have ethnically mixed populations as you do in Britain it is entirely possible for the ethnicity estimates to be confused. But do they admit this without being challenged? Not on your life! They want to pretend, as I see Ancestry is now doing on TV ads, that they have meaningful results for dozens of ethnicities when the reality is they are only guessing. Note also, by the way, the complete absence of ANY West and Central Europe ethnicity in the MyHeritage estimate. That is clearly impossible for the reason I gave; how did my ancestors arrive in Britain? Were they transported there directly by jumbo jet from Greece without setting down anywhere in between? To make things even more dubious, I recently had my brother’s DNA analysed by MyHeritage (only because they have the cheapest prices around). His results are completely different than mine though in terms of shared Centimorgans we are clearly brothers (no “accidental” relationship). These figures are more credible than mine, though the preponderance of non-British ethnicity is obviously spurious. Quite a remarkable and inexplicable mix. Keep in mind that MyHeritage did the testing and I only uploaded Glen’s results from those tests to FamilyTreeDNA. My suspicion is that MyHeritage botched the analysis. How else to explain this ridiculous lack of symmetry between the ethnicity estimates of the two companies for Glen himself and for Glen and I in comparison to one another? My highest match on My Heritage is 51.6 cM. I was quite excited about this because I have very few cousins on any testing platform, 51cM would be my 5th highest match to date. So I contacted her and we were chatting for quite sometime trying to find how we possibly match. Going by the information we had we are related on my father's side and her father's side - both of us had little information on those side so were excited to see what we could learn. Then we swapped Gedmatch numbers. We only share 5.6cM! I know this story is about close siblings readings being wrong, but when My Heritage tells you someone is possibly at second- fourth cousin and you're trying to fill in blanks in your tree, it's really misleading!